The discovery of a trove of potential alien planets, including dozens that could be Earth-size or habitable, is heartening news for those hoping to discover E.T. one day. NASA's Kepler Space Telescope found 1,235 planet candidates beyond our solar system, according to an announcement Wednesday (Feb. 2). Of those, 68 are thought to be about the size of Earth, and 54 are at a distance from their stars where liquid water should be able to exist. However, none of those planets are actually confirmed to exist — they are merely potential planets that must be verified with follow-up studies. Furthermore, none of them are guaranteed to be habitable — scientists know only that there is a chance they are, based on the picture we have now. Still, the finds boost scientists' hopes that Kepler, which was launched in March 2009 to hunt for extrasolar planets, would turn up a large collection of worlds with suitable conditions to host extraterrestrial life. Such a large haul of possible planets within the observatory's first two years of operation is promising. "I think it's heartening in the sense that we certainly had hoped that this was going to be the case," said Seth Shostak, senior astronomer for the SETI (Search for Extraterrestrial Intelligence) Institute in Mountain View, Calif. Yet he said a lot more data are necessary before we have reasonable odds of finding life, if it exists at all. "What you need is not 50 candidates, you need a lot more," Shostak told SPACE.com. "But the facts are, this suggests there are a lot more. Earth-like worlds might be as common as ants at a picnic." Still, even a verified Earth-like alien planet is nowhere near a guarantee that intelligent life exists there. "It may be that there are many, many worlds that are like Earth but only a few have life," Shostak said. "Or maybe a lot have life but very few produce clever critters that can wire together a radio transmitter." Shostak said Kepler's finds have already affected the search for our cosmic neighbors. 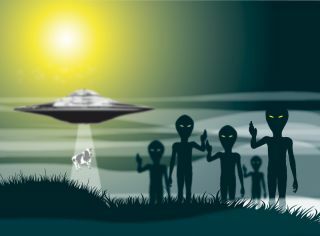 And studies such as the new Kepler work are helping scientists refine some of the key parameters used in the Drake equation, a formula at the heart of SETI that predicts the likelihood of communication with intelligent aliens. The Drake equation is based on seven factors: the rate of star formation in the galaxy, the fraction of stars that have planets, the fraction of planets that are habitable, the percent of those that actually develop life, the percent of those that develop intelligent life, the fraction of civilizations that have a technology that can broadcast their presence into space, and the length of time those signals would be broadcasted. The new SETI results could directly affect the calculations of two of those parameters — the fraction of stars with planets and the fraction of those that might be habitable, Shostak said. "The trouble is, even if you know six of the seven terms very well that seventh could still kill you," he said, explaining that we have very little idea just how long alien civilizations are likely to last to continue broadcasting a signal.